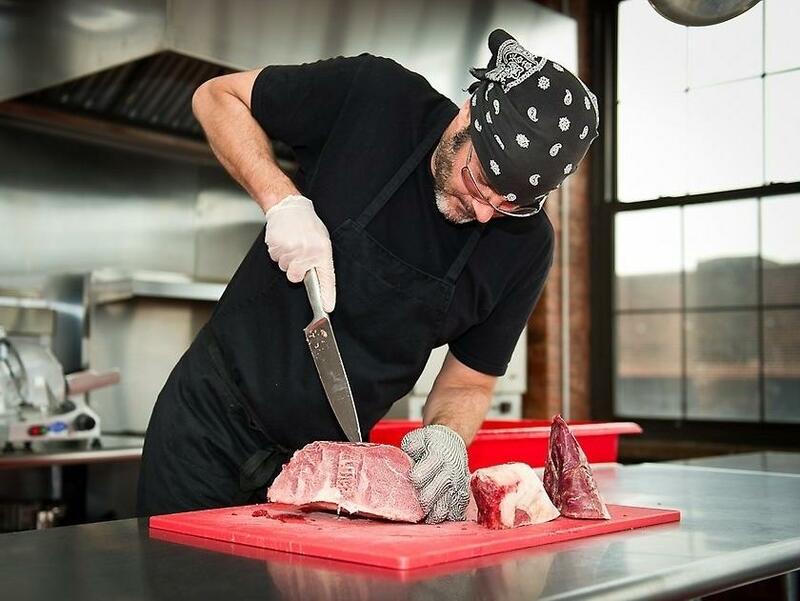 Every week, Robert Stout of Kings County Jerky slices meat by hand. 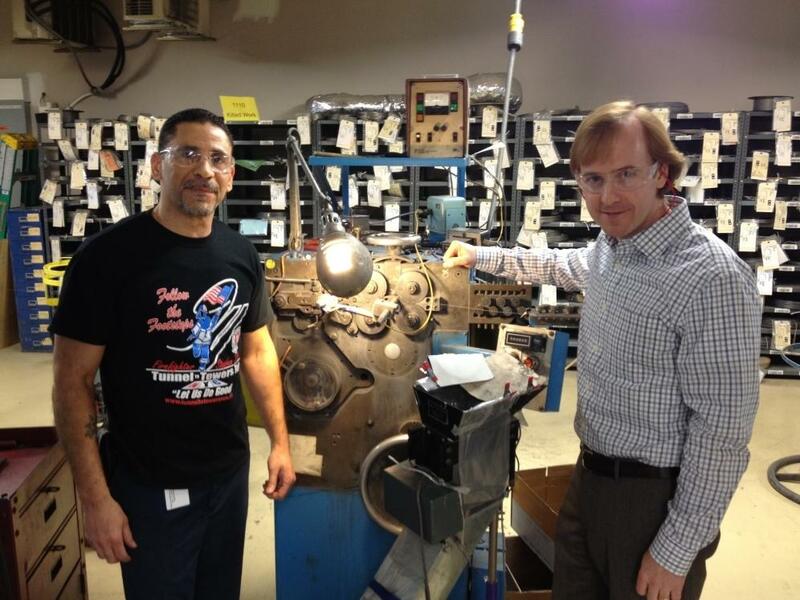 Juan Delgado (left) and Steve Kempf of Brooklyn's Lee Spring company stand with a 50-year-old coiling machine, still in use today. One day Chris Woehrle decided to finally leave his corporate job and pursue his dream: to become an artisanal food craftsman. And so, every day at home, he'd basically pickle stuff. "I had a refrigerator full of plastic food buckets that were full of pickles and kimchee and sauerkraut and harissa and salsa and ketchup and mustard and, you know, any kind of craft food you could make," Woehrle says. Woehrle lives in Brooklyn, where shops are filled with handcrafted, grass-fed, organically raised whatever. Too much of it, in fact. Every time Woehrle had a good idea, he found eight other companies were already making precisely the same kind of mustard or pickled radish. "You don't want to play a marketing game where it's just like, let's out-market the other pickle people," Woehrle says. Eventually, though, he and his partner found a hole in the market: all-natural beef jerky. Kings County Jerky was born. Two guys, a small warehouse in Brooklyn and 25 pounds of beef a day. The Kings County approach is a model for how manufacturers in many sectors can do better. Ignore low-priced commodity products. Focus instead on customizing high-quality goods for a select audience willing to pay a premium. It works even on something as simple as a spring. "Springs are critical to the day-to-day functioning of everybody's lives," says Steve Kempf, CEO of Lee Spring in Brooklyn. My eyeglasses have springs. Our audio recorders have springs. And each of those springs has to solve a slightly different problem. "You take this wrench here for example," he said, picking up a wrench from his desk. "It's got a very unique L-shaped spring design. And so the product designer wants to come up with an elegant design, and he also has a very specific force he wants when you let go of this wrench so that it opens in your hands and feels comfortable." Think of this as an artisanal craft wrench. And a craft wrench needs a craft spring. This is good business, by the way. Companies will pay more for a spring that precisely meets their needs than they will for some off-the-rack spring. The springs at Lee Spring are gorgeous displays of ingenuity and skill. Making them requires knowledge and artistry. It's a true craft. Craft jobs typically pay more, so the workers at Lee Spring tend to do better than workers who don't have all those spring skills. Even big manufacturers — like Toyota, General Electric, Dow Chemical — are focusing more of their business on custom-making products for customers willing to pay more. It's one of the best alternatives to competing with China and other low-wage countries, which have perfected the commodity business of turning out lots and lots of identical products as cheaply as possible. Forget that model. In America, we can focus on craft. That's where the money is, and that's where the hope lies for American manufacturing. Let's look at a part of the economy you can glimpse in the aisles of a grocery store. Maybe you've noticed a pickle jar with a rustic looking label or more microbrews in the beer aisle, brands you wouldn't see advertised on TV. These kinds of foods are becoming a regular offering. And as Planet Money's Adam Davison reports, far from being a niche market, craft food makers might just represent the future of American manufacturing. ADAM DAVIDSON, BYLINE: One day Chris Woehrle decided to finally leave his corporate job and pursue his dream - to become an artisanal food craftsman. And so every day at home he'd basically pickle stuff. CHRIS WOEHRLE: I had a refrigerator full of plastic food buckets that were full of pickles and kimchi and sauerkraut and harissa and salsa and ketchup and mustard and, you know, any kind of craft food you could make. 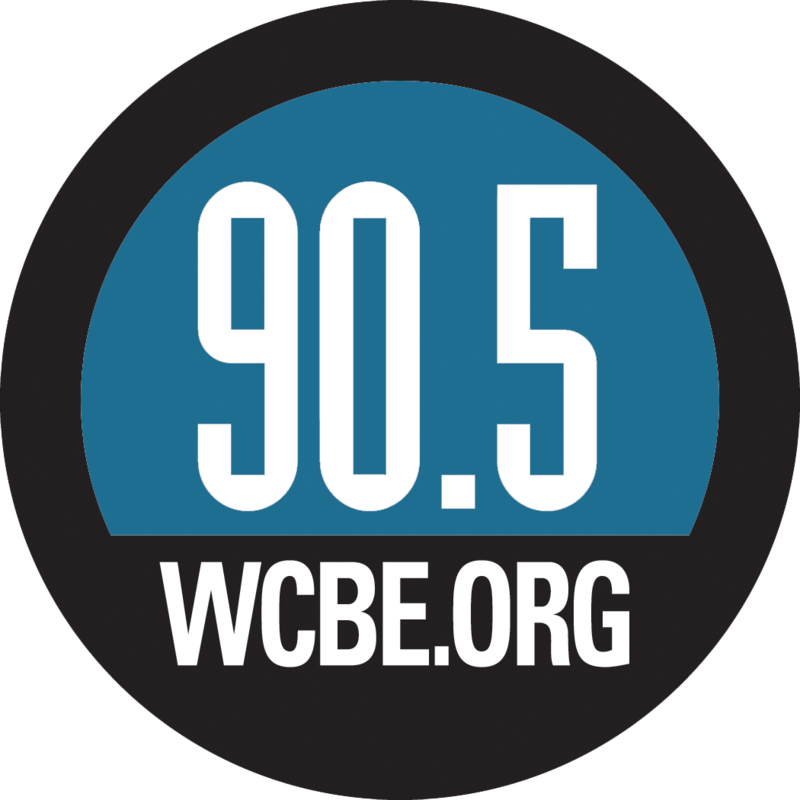 DAVIDSON: Chris Woehrle lives in Brooklyn, where shops are filled with hand-crafted, grass-fed, organically raised whatever. Too much of it, in fact. Every time Woehrle had a good idea, he found eight other companies were already making precisely the same kind of mustard or pickled radish. WOEHRLE: You don't want to play a marketing game where it's just like, let's out-market the other pickle people. DAVIDSON: Eventually, though, he and his partner found a hole in the market: all-natural beef jerky. Kings County Jerky was born. Two guys, a small warehouse in Brooklyn, and 25 pounds of beef a day. Food manufacturing - from a small shop like this one all the way up to those huge food conglomerates - add up to big business, well over half a trillion dollars a year. And the Kings County approach is a model for how all manufacturers can do better. Ignore low-priced commodity products. Focus instead on customizing high quality goods for a select audience willing to pay a premium. It works even on something as simple as a spring. STEVE KEMPF: Springs are critical to the day to day functioning of everybody's lives. DAVIDSON: Steve Kempf runs Lee Spring, which makes, no surprise, springs. DAVIDSON: Steve listed off all the springs in his office for four minutes. We timed him. My eyeglasses have springs. Our audio recorders have springs. And each of those springs has to solve a slightly different problem. KEMPF: You take this wrench here, for example, and it's got a very unique L-shaped spring design. And so the product designer wants to come up with an elegant design and he also has a very specific force he wants when you let go of this wrench so that it opens in your hands and feels comfortable. DAVIDSON: Think of this as an artisanal craft wrench. And a craft wrench, of course, needs a craft spring. This is good business, by the way. Companies will pay more for a spring that precisely meets their needs than they will for some off the rack spring. Incidentally, it makes spring manufacturing also a lot more fun. JUAN DELGADO: The puzzle solving is what I love to do, OK? If you don't have a puzzle for me, I tend to get bored. DAVIDSON: Juan Delgado is a coiler, and when he started here, 35 years ago, Lee mostly did make standardized springs, same thing every day. Now each day there's a surprise. DELGADO: A regular spring - let's see if I find - here's a regular compression spring. This is boring to me. DAVIDSON: Then he pulls out this crazy cone-shaped spring. DELGADO: This - I look forward to things like this. DAVIDSON: Just look at the gorgeous way the coils taper and don't tangle when you press down. Making something like this cone-shaped spring, that requires knowledge, artistry, in other words it's a true craft. Craft jobs typically pay more, so Juan does better than someone who doesn't have all those spring skills. Even big manufacturers, like Toyota, General Electric, Dow Chemical, are focusing more of their business on custom-making products for customers willing to pay more. It's one of the best alternatives to competing with China and other low-wage countries which have perfected the commodity business of turning out lots of identical products as cheaply as possible.